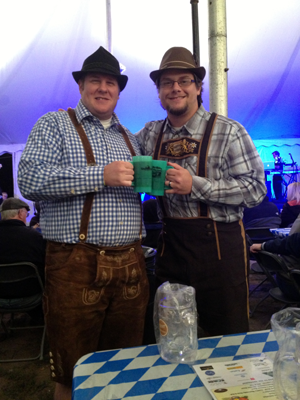 I would like to start right off the bat with giving credit to the Naper Settlement Oktoberfest. 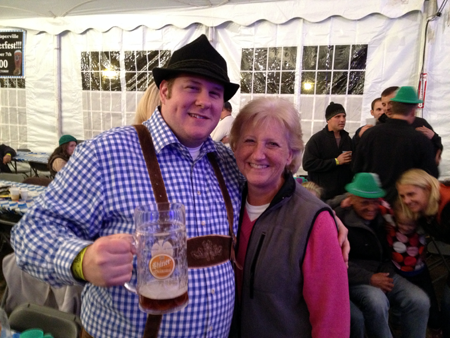 As you may have ready before, the Naper Settlement Oktoberfest was the first local Oktoberfest I visited after coming back from Munich in 2010 and to put it lightly, it wasn’t anything I would write home about. Luckily, the website didn’t exist back then and I didn’t write a review because it might be as bad as the Villa Park Oktoberfest. 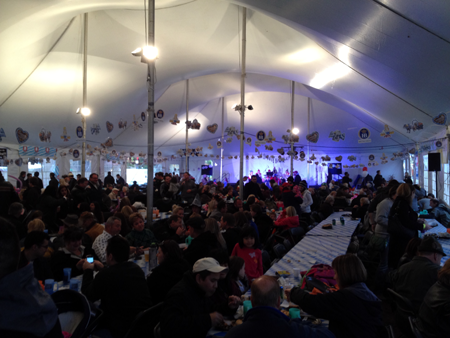 Every year since then the Naper Settlement Oktoberfest has gone above and beyond my expectations for the event. This year they improved once again beyond what I would have expected. First off, they moved the location of the tent to a more centralized area inside the grounds of Naper Settlement. It was nice to be right in the middle of the old buildings at the park. The organization of the event was better as well. There was a special tent dedicated to selling the collectable plastic mugs and beer tickets so as to speed up the process and probably help them not have too many people dealing with money. The tent seemed bigger than last year although that may just be an illusion because there was less room around the tent than in previous years. The biergarten section was improved from last year and it would have been a wonderful place to sit if the weather was ten degrees warmer. Thankfully the tent was “heated” this year. In the evening you could tell a noticeable difference in temperature but warmer clothes are still recommended. The layout of the tent was similar to previous years; long rows of tables and chairs that ran from the front of the tent to the back with a large aisle in the middle. All food and drink were located in the back of the tent and the band stage was up front. Similar to last year, they decided to go all Oktoberfest for the beers this year offering Hofbräu and Spaten Oktoberfest as well as Shiner Oktoberfest. Two different wines were offered as well but I don’t remember if they were German or not. The food was once again provided by My Chef Catering who has done the previous years’ events and it was as good as last time. The only downside I had on the food was the over-salted pretzels but that is easily remedied by just brushing off the salt. The previous years I always attended on a Friday night but this year I was able to come on Saturday and see the bulk of the German entertainment. The day started off with the Ron Keller German Band which provided your typical Oompah music. They did play Ein Prosit within their set but no one sang so it was up to my buddy Eric and me to help the people around us. Die Musikmeisters followed with even more German music, this time with singing. I saw these guys last year and they were even better this year. They really got the crowd going. It was about this time that my buddy and I were interviewed for Naperville TV. They liked us because we were all dressed up for the occasion. The interview was short and sweet but it is always fun to be on TV. We also had our pictures taken for the Naperville Magazine. Die Musikmeisters were on for a good hour and a half then The Legends closed out the night. 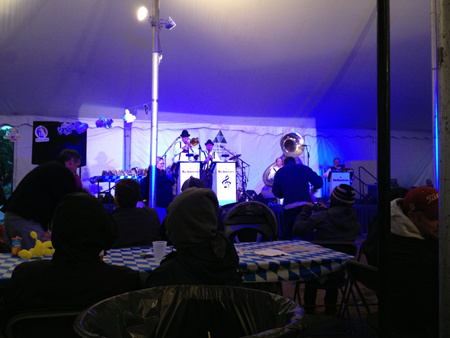 They played hits from the ‘60s and ‘70s which actually fit in well with Oktoberfest. First off, they weren’t a German band so the majority of the people there knew the music but the music they did play was great and they included a number of songs in their set that you would actually hear in the tents in Munich. I doubt they did this on purpose but I appreciated it. We ended up staying to the very end and my buddy Eric won the final raffle which included two Shiner plastic Maß, eight Spaten half-liter glasses with Oktoberfest logo on the front and two metal Hofbräu signs. Eric was generous and gave me half of the haul. I have the sign already hung up in my bar area. 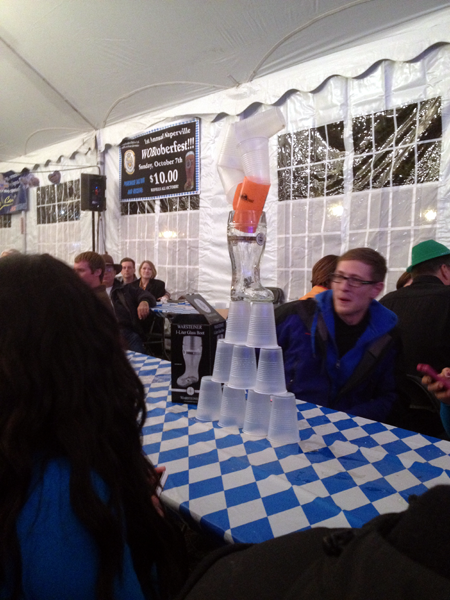 All in all, the Naper Settlement Oktoberfest continues to impress. The decorations in the tent, the quality food and beer, and the perfect Oktoberfest atmosphere make this an event I am happy to promote now. I can’t want to see the changes for next year. I might even have the inside scoop because I am planning on helping volunteer for the event next year assuming I’m not in Munich. 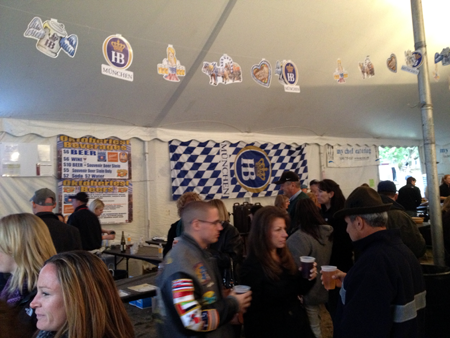 If you get a chance to come out to the Naper Settlement Oktoberfest I would recommend it.